Study this photo of Reggie Bush, becuase this talent that made him feared in college football has often reduced him to a pedestrian player in the NFL. Photo by JSnell. The idea of compiling a rankings analysis across several years of Rookie Scouting Portfolio publications has been a popular request by readers for years, but something I have resisted doing. For a complete explanation why please read Part I. If you want to know how my ranking of these players differs from the actual process I use for the RSP publication please read Part I. And if you want to know why I view this exercise as an entertainment piece and not a more serious analysis please read Part I. Moreover, if you want to see players 11-20, you know what to do. See, I didn’t even need to say it. I’m already thinking I didn’t rate Ahmad Bradshaw as highly as I should have. He was my No.4 RB in a 2007 draft class that included Adrian Peterson, Marshawn Lynch, and the more well-known Kenny Irons, Lorenzo Booker, and Gary Russell. I forgot how much I valued Bradshaw and if I were to re-do this ranking tomorrow he might have been a little closer to my top 10. Laurence Maroney did not my my cut after all. The closer I read my analysis and film study notes I realized that while I saw starter upside and seriously impressive potential in terms of his skills in the open field, I was not as impressed with his skills after contact and I had questions about him becoming a feature back. That said, I never thought he’d be a bust. I thought at worst, he’d be a valuable committee back capable of seasons of 1100-1200 yards. Xavier Omon was a highly rated back in my 2008 publicatin. I saw him as safe starter in the same way I saw Joseph Addai as a safe starter. Omon wasn’t dynamic like many of the backs I ranked below him, which included Felix Jones, Jamaal Charles, Darren McFadden, and Chris Johnson. All four of these players possessed more athletic upside and had star potential. However, I thought Omon could be no worse than Marion Barber with the upside of a Stephen Davis or Rudi Johnson. Nothing flashy, but a safer chance at a longer, more productive career. For an analysis based on what I do for the RSP publication, I stand by that ranking. For entertainment value based on potential to be great, he doesn’t make the list. 10. Jamaal Charles, Texas: As a freshman, Charles walked up to the microphone at the press conference announcing his arrival to the University of Texas and told the media that he was going to make everyone forget that they lost out on Adrian Peterson. Charles still hasn’t made anyone permanently forget about Peterson but to his credit he was a great diversion. Charles was my eighth-ranked back in the 2008 RSP and I wrote that if Charles could hold onto the football consistently, he would be much higher. I compared his elusiveness to Marshall Faulk in its rarity, but that he sometimes ignored the path of least resistance. If he matured, I thought he’d be a tough all-around playmaker in the NFL. He all too frequently fumbled the ball and bounced runs outside or across the formation that he had no business trying to do. He was inconsistent, undisciplined, and you sometimes wondered if he was one of those big-talking players that didn’t work hard enough to back it up. But beneath all of these troubling issues were flashes of physical and conceptual genius that could take your breath away. 2008 RSP Quote: Charles needs to learn to make wiser choices as an inside runner. He either doesn’t bounce plays outside when it’s the best choice for the play or he will wait too long at the line of scrimmage before making a decision. Sometimes he’ll just make a risky move to elude a player behind the line of scrimmage. Charles clearly sees the holes, but doesn’t always show the patience to press the holes to cutback on inside runs. He has patience as a runner, but doesn’t always make the best decision…It’s as if he’s bored and wants to opt for the highest-risk choice to see if he can execute it…This is a dangerous prospect for a team to acquire in the sense of the word “dangerous” having multiple meanings. One of the performances that convinced me that Charles was a tough, physical football player and not just a game-breaking ball carrier in space was at Ohio State as a freshman. He only had 10 carries for 26 yards in this game, but he also had 6 catches for 69 yards and he ran hard and he played with heart and toughness, knocking the ball loose from James Laurenitis during an interception return in the first half. He’s arguably the most dynamic running back in the NFL since Marshall Faulk or Ladainian Tomlinson in his prime. If I were ranking Charles based on his potential as a safe pick, he wouldn’t have been in the first 15 spots of this list. However, ranking the player based on his upside Charles was a no-brain er for this top-10 because as I mentioned, the issue was never his size or physical upside. Some might argue that LeSean McCoy should have been in this group then as well, but he doesn’t have the same high-end, game-changing explosiveness as Charles. I also felt McCoy wasn’t bouncing making poor choices for the same reasons Charles was, which could have facilitated a longer adjustment time. 9. Deangelo Williams, Memphis – As with Maurice Jones-Drew there were some questions about Williams’ size and he wasn’t the blocker that Jones-Drew was. In fact, I’m already wondering again why I don’t have Jones-Drew ranked here instead of Williams. However, the answer is that I thought Williams didn’t rely on his power in the same way Jones-Drew did and me (and most analysts) had questions about Jones-Drew’s power transitioning to the NFL. I figured Williams at least knew how his game was best-suited to the NFL and he’d maximize those tendencies. This isn’t to say that Williams wasn’t strong enough to run through tackles. I thought he was one of the more fundamentally sound runners I had seen of the 2006 class of runners. 2006 RSP Quote: In fact if there is a back that reminds me of Tony Dorsett, Williams is that player.Williams had an excellent burst and smooth open field moves. His best traits are vision and balance, but the variety of moves are impressive: giving and taking away a leg to the defender, spins, lateral jump cuts, and small cuts while moving at full speed. He is just as capable of being a one cut runner as he is of making multiple moves. When running out of a single back set or I-formation, Williams is dangerous because he’s able to make cutbacks facing the defense head-on. Four of Williams’ best five runs of the day were from a single back set running forward to the line of scrimmage. He displayed stamina in the 4th quarter where he averaged 4 yards per carry for his last 10 carries of the day. The concerns about Williams had a lot to do with an Memphis offense that used a spread set and motioned the runner from a receiver spot to give him a running start to stretch the edges of opposing defenses. Would he do an effective job of spotting holes and setting up creases from a more traditional set? Although it took him a few seasons in the NFL to get going and he’s only had one elite year, former NFL coach Jon Gruden stated a few years ago on Monday Night Football that Williams was perhaps the best running back in the NFL and he wasn’t forgetting about Adrian Peterson. I think most fans would have a different opinion, but I agree with Gruden that Williams’ talent is of the caliber that I expected him to be mentioned in the same class of players like Peterson, Jones-Drew, and Ray Rice in terms of season-to-season production. And if you watched Williams put on a clinic in open field running versus the Saints a few weeks ago, then you know that talent is still there. While I admire Williams’ loyalty to his current team I was surprised he didn’t wind up with another team where he could have earned more individual notoriety. 8. (Tie) Ryan Mathews, Fresno State – I don’t think Ryan Mathews really knows how good he can be and I think people who watched him play in college noticed that on some subliminal level and questioned whether Mathews could be anything more than a terrific college running back. I heard comparisons to Ryan Grant, which I can see but only if you understood that Mathews was a much more athletic talent than Grant and could concede that if Grant was Mathews’ basement in terms of potential then Adrian Peterson was the top of Mathews’ ceiling. 2010 RSP Quote: Mathews might be the best pure runner in this class. He has the power to break arm tackles and the pad level to bounce off hits. Mathews’ speed is good enough to gain yards on runs he bounces outside and his burst in and out of cuts makes him dangerous to break big runs at any time. I’m especially impressed with his vision. There are a lot of people who don’t think he has good vision, but I think he might have exceptional skill at finding small creases as well as anticipating where the holes are going to open. He runs with good patience behind pulling linemen and he only had one run in this game where he could have exhibited more patience behind his FB. I also like that he keeps his eyes downfield on the third level when he’s running through the first level, which shows his skill at reading the next level on a consistent basis. If he can become a better third down player, he has ball-carrying skills to be a productive feature back in the NFL. I believe Norv Turner, who has coached both Emmitt Smith and Ladainian Tomlinson, knew Mathews had this kind of talent and was probably enthusiastic about trading up in the first round to grab the junior. Although Mathews had too many underwhelming moments to hold down a feature role as a rookie, there was plenty of evidence of what was to come in 2011 and Turner remained confident in making the runner San Diego’s focal point. Mathews’ overall game doesn’t belong in the same conversation as Adrian Peterson’s, but it’s getting closer than you may think. If not for questions his pass protection, injuries, and reports from former coaches that Mathews lacked self-esteem and a healthy belief in himself, he might have cracked my top five. 8. (Tie) Cedric Peerman, Virginia – Of the players that haven’t distinguished themselves in the NFL Cedric Peerman is my favorite prospect that I’ve watched during my seven years studying games for the RSP. I honestly still believe Peerman is capable of becoming a very good starter in the NFL, but I think he’s one of those players that got lost in the shuffle the same way that Arian Foster nearly did. I don’t think you can convince me of a reason that has to do with his ability until I see him with my own eyes. In fact, even when I have seen Peerman in those Bengals preseason games he has done nothing to convince me that he wouldn’t become a good NFL starter if Cincinnati gave him a chance. When I watched Peerman at UVA I saw a back with similar potential to Frank Gore. Although he didn’t score as a franchise back on the quantitative parts of my analysis, I thought his vision, speed, balance, and ball security were among the best in the 2009 class of rookie backs. Peerman had a knack for getting the yardage his team needed and he routinely did it by anticipating the defense, using his physical skills, and running with a level of determination that I have only seen from a few backs (Bradshaw, Ray Rice, and Peterson) in the years I’ve been studying players. He was never very productive: Peerman sat behind Wali Lundy and Jason Snelling when he first arrived at Virginia, returning kicks, and amassing a whopping total of 116 carries as a freshman and sophomore. He got his chance as a junior and until he suffered a Lisfranc injury during the sixth week of the season, he was the leading rusher in the ACC. In my opinion, he’s shown enough on film that he’s a productive football player. More so than backs like Edgerrin James, Willie Parker, Priest Holmes, Terrell Davis, and Ryan Grant who either split time or saw no carries at all. He lacks speed: When I watch Peerman face three traditionally fast defenses in Miami, Virginia Tech, and Georgia Tech and he appears to be one of the quickest and fastest players on the field, that’s a pretty good indication that Peerman’s 10.6, 100-meter dash isn’t fiction nor was his 4.39 40, a combine-best for RBs. What might throw some observers off his game is the fact his offensive line is forcing him to operate in tighter spaces than the more established stars in college football. His small hands make him a liability for turning over the football: Peerman had a fumble in the last game of the year versus Miami in OT and then another fumble in the Senior Bowl. When the NFL measured Peerman’s hands, they openly worried his hands are part of the problem. It’s a reasonable explanation, except when you learn that Peerman had 448 touches in his career at Virginia prior to the Senior Bowl and only one fumble. There is no way that stat makes it reasonable to presume he’s a liability for laying the ball down. Plus, I watched that fumble and I bet at least eight out of ten players would have lost the ball on that play if they were fighting for extra yards like he was. I didn’t see Peerman have any issues carrying the ball away from his body on most plays and on this play where he fumbled he had the ball against his chest. The defender stood him up and then punched down on the football from an angle a defender normally doesn’t get with his free hand. He’s an injury risk: His most serious injury that required him to miss more than a game was his Lisfranc injury sustained in 2007. It’s a scary ailment for athletes because of the complexity of the human foot, and used to have a great chance to be career ending. But in recent years the NFL has seen its scare of players rehabilitate successfully from this injury, including Correll Buckhalter, Brian Westbrook, Justin Tuck, Michael Strahan, Ty Law, and Phil Simms. The games I watched of Peerman performing were from this year (and he looked fine). Once you’re beyond these three misconceptions about his career, there’s very little not to like about Cedric Peerman. He is considered a team leader who plays with a great deal of enthusiasm. He’s a physical player who understands how to use his leverage to get the better of his opponents in a collision. Virginia Tech defensive coordinator Bud Foster said that Peerman’s stiff-arm is “the best in the business.” At 5-9, 216 lbs, Peerman has more than enough size to be a feature back. I believe his best days as a running back are on their way. NFL teams may downgrade Peerman as a second-day pick, but I almost ranked him over Chris Wells. When Peerman gets into a camp, it will only be a matter of time before he establishes himself as a real find. He’s built and runs very much like 49er back Frank Gore. The score is depressed due to injuries, but I think skill-wise he’s nearly on par with The most underrated skill player in this draft. Moreno in terms of vision, and he’s faster and more powerful. I think he has enough upside to be franchise back. You can get him in round two or three. He’s Frank Gore’s twin on the football field. I didn’t know anything about Cedric Peerman when I flipped on the Virginia Tech game, but by the time the game ended I wasn’t sure I had seen a better back in 2008. No one is giving him near the same level of attention as they are giving Knowshon Moreno, Beanie Wells, and Donald Brown…Simply put, he may be the most underrated skill player in the 2009 Draft. The Ravens drafted Peerman and he dealt with hamstring injuries while Ray Rice turned heads his second year in camp. Baltimore still have Willis McGahee and Jalen Parmele was a healthier reserve option so Peerman was cut. He stuck with the Browns and Lions for all of a minute but he was still dealing with the muscle injury and they each cut him. The Bengals have kept Peerman, but we only get to see flashes if his prowess as his potential rots on the vine. Matt Forte's game deserves your respect. He's been fighting an uphill battle (and holding his own) since he was at Tulane. Photo by Tyle_r. 7. Matt Forte, Tulane: Imagine the overall take you’d have of a running back when he averaged 1.9 yards per carry behind an offensive line where only one of those lineman could bench press as much weight as 1 of 68 other players on a national championship caliber defense that was statistically tops in the country and had several future first-day draft picks. If that take was anywhere as bad as the criticism Forte received in some circles of fans during his underwhelming second year in the NFL behind a bad Chicago Bears line you would have been as wrong as they were. It was shocking how good Forte looked despite his statistical production in that game. 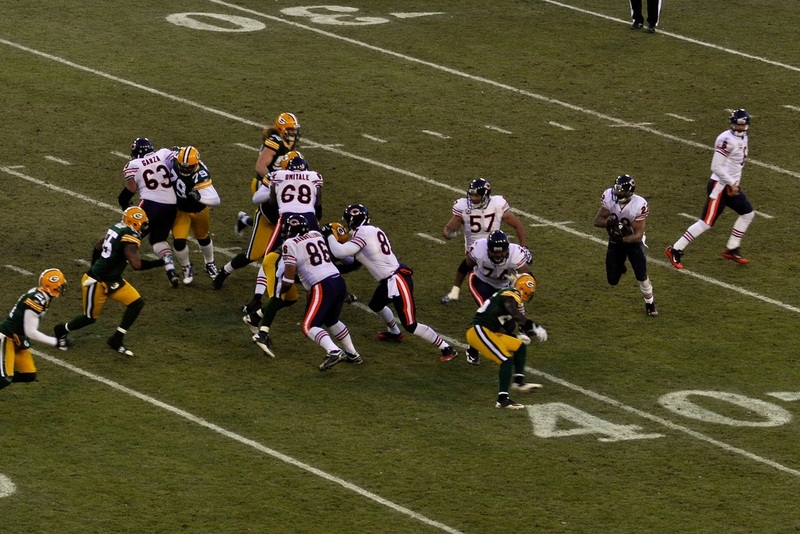 2008 RSP Quote: Forte runs like a potential NFL starter in the sense that he knows when to make the most of what yardage is avaialble to him. This is in spite of the fact he has very good vision, quick reactions to penetration, and can make the first man miss. Most runners with this kind of agility and vision are still learning to play tough and decisively between the tackles. However when it is time for Forte to lower his shoulder or bury himself against his linemen, he will do so. He is a quick runner with good size and he isn’t afraid to deliver a hit before he is hit. He has no problem following his blockers and he doesn’t lose yardage looking for the home run play.He has terrific instincts and moves between the tackles.His acceleration is deceving. He might be one of the top three backs in this draft. As a runner, he might be the best. LSU gave up 26.8 rushing yards per game prior to this contest. Tulane actually led 9-7 with 1:40 in the half. In this game, he had at least 4 plays where he had to make a man miss in the backfield before getting to the hole. Each of those gains were for at least 4 yards and easily could have been losses of at least 3 yards. Forte is the ultimate example why numbers always need a context in order to convey truth. I don’t think it’s a coincidence that I have three runners on this top 20 list whose talents transcended poor production versus strong defenses (Addai vs. a top-ranked Auburn defense; Bradshaw versus a top-ranked Tennessee defense; and Forte vs. LSU’s top-ranked defense). You know something is wrong with the NFL marketplace when Chris Johnson can get paid to run like Lendale White and Matt Forte is the Bears offense and Chicago won’t reward Forte the contract he has earned. The only reasons I didn’t hold Forte in higher regard was that despite him looking this good against a terrific LSU squad, I didn’t see enough of his college games and he was still developing as a pass protector and receiver. Forte also didn’t appear as explosive as some of the backs I saw before or since and I thought there might be a chance that my eyes were fooling me when it came to how athletic he appeared. Lynch's all-time great playoff TD run was what I would have expected from the Lynch I saw at Cal. Photo by Matt McGhee. 6. Marshawn Lynch, California: If you were one of the NFL fans that watched and wondered what got into Marshawn Lynch during his game-sealing, “GET OUTTA MY WAY,” Beast Mode playoff run through the Saints defense last year, then you have it backwards. The real question was where have you been, Marshawn? This was the Lynch we saw frequently as a rookie with the Bills and it was the Lynch we routinely saw at Cal. I thought he was more prepared to make the transition to the NFL than his classmate Adrian Peterson, who was an absolute force of nature but had at least one glaring issue and another minor problem to fix in order to become a consistent NFL stud. Lynch on the other hand had very few weaknesses, in my opinion. As a runner he occasionally initiated contact with his pads a little higher than he should and he was still developing as a pass protector. But around the ball, Lynch was a terrific prospect. 2007 RSP Quote: Lynch ran very hard in this game (vs. Texas A&M). He demonstrated good power and balance. He was not afraid of initiating contact and he possesses a good stiff arm and leg drive between the tackles or when wrapped up. He’ll actually make the most of his yardage rather than dance around when there is no space. He has the lateral movement, but only once in this game did he try to reverse his field than plow forward for positive yardage. He generally catches the ball well and with his hands. Lynch has a very sudden first step and can accelerate to full speed within a short distance. He demonstrates good ball protection in the hole. 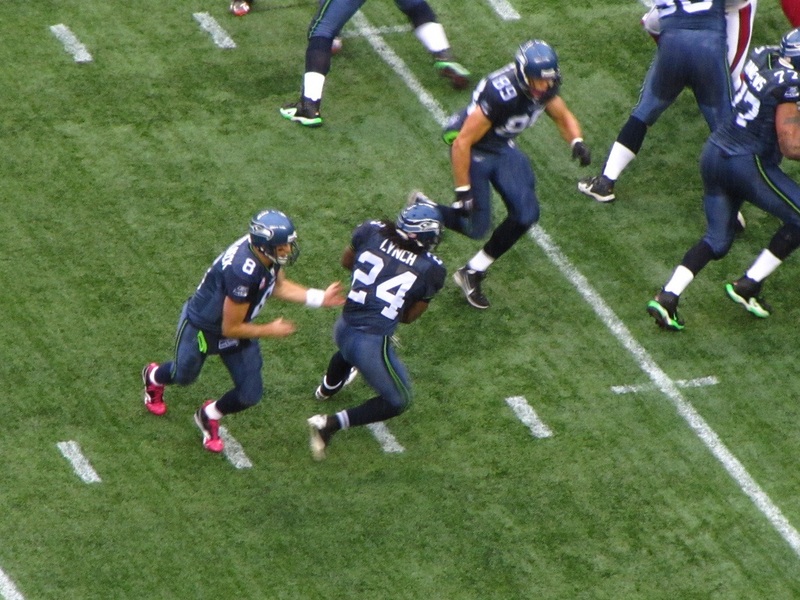 Lynch also makes the effort as a blocker. He has potential to be an excellent all-purpose back in the NFL. He has the skills to play in any system and should become a lead back within a year or two. He’d be excellent in a West Coast system such as Seattle, Philly, or Green Bay. I was also impressed with Lynch’s toughness. 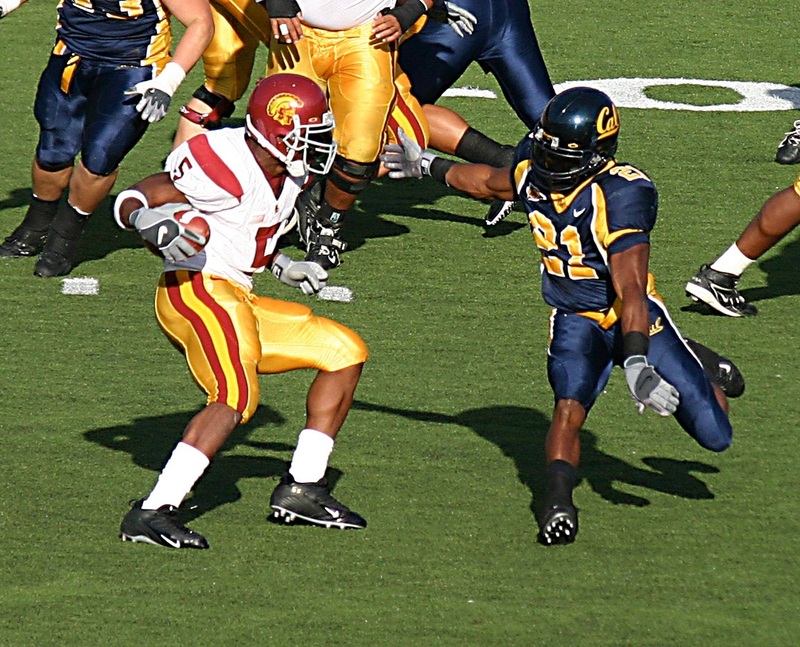 Against USC in 2006, he gained 109 yards from scrimmage, broke 6 tackles, and earned 5 first downs on 20 carries despite playing on two ankle sprains. There were some significant off-field issues at Cal and in the early days of Buffalo that derailed his chance to perform to his potential. Kudos to Fred Jackson but if Marshawn Lynch played (and worked) to his potential in Buffalo, Jackson might have had to earn his opportunities elsewhere. 5. Ray Rice, Rutgers: The first word that came to mind when I watched 5-8, 199-lb. runner Ray Rice at Rutgers was “Workhorse.” Five years later, and Rice is one of the few workhorse backs in the NFL despite the fact that there are runners that possess the ideal height, weigh 20-30 pounds more than Rice, and have the breakaway speed the Ravens feature back lacks. It doesn’t matter, Rice’s game has always encompassed the skills that matter most for a NFL runner. 2008 RSP Quote: Rice runs with good pad level, gets north-south quickly, and runs with very good vision between the tackles. He can make cuts in the hole, make the first man miss with a lateral move, and initiate contact at the end of runs. One of the best things about him as a runner is his ability to gain yardage after contact and his decisiveness at the LOS. He faced 8-10 defenders in the box all night long and just got better as the game went along. He has a very low center of gravity and thick legs. He protects the ball very well as a runner. This is a back who should have an opportunity to start for an NFL team by his second season and be a fixture in an offense…I think Rice will be an every down back in the NFL and potentially a Pro Bowl player. What I appreciated about Rice was his burst and stamina. He not only possessed strong acceleration but he was as adept as any runner I’ve seen time that burst at the right moment in crease or the edge to reach the second level of a defense. This acceleration also came with a strong understanding of how to press an opening to set up his burst. The stamina was just icing. I watched Rice earn 36 carries five days before he earned another 39 carries against a highly touted South Florida defense. Rice wore both defenses down and didn’t appear worse for the wear. Conceptually, Rice might have been the best prospect I’ve studied since authoring the RSP publications. 2006 RSP Quote: I think Bush may at first rely too much on his elusiveness when he enters the pros. He will learn quickly that he can’t do too many start-stop moves at the line of scirmmage and successfully elude a NFL defensive unit. Unfortunately Bush had the same issue we saw from Florida State wide receiver/utility player Peter Warrick: both players thought they could stop, change direction, and accelerate before the pursuit caught up with them. They were wrong far more often than allowable in the NFL. I actually believe Bush attempted to reverse his field and bounce runs outside as a pro more often than he did at USC. It was as if he was trying too hard to meet these legendary expectations set for him rather than just play his game and allow the big plays to come to him. I still see flashes of the USC Reggie Bush and while some of the more disappointing facets of Bush’s game are his responsibility, I wonder if he were in LeSean McCoy’s offense with Michael Vick or Chris Johnson’s offense with Vince Young would Bush have been regarded more like these two backs rather than a versatile, but limited specialty player? 3. Mark Ingram, Alabama: Ingram may not be having the rookie season that’s indicative of his ability, but in terms of potential he’s among the best runners I’ve seen since I began studying an in-depth study of players. Ingram’s balance, burst, and decision-making are all special. I think the best way to describe Ingram is to consider him a bigger and strong runner along the lines of Ray Rice. At Alabama Ingram flashed tremendous versatility as a pass protector, receiver, and inside runner. His burst was special and his ability to set up defenders a step ahead of what he was doing was a joy to watch. Trent Richardson might be more physically talented than Ingram and perhaps Richardson might one day top Ingram on a list like this. However, it’s also possible we could be equating Richardson to a physical talent like Herschel Walker and Ingram to a football talent like Emmitt Smith. This year the Saints don’t really need to rely upon Ingram, but within the next year or two that will change. I still come from the school of thought that physical runners with vision, burst, agility, balance, and stamina possess the ideal combination of skills for the pro game. Ingram has all of those. 2. Jonathan Stewart, Oregon: Stewart was perhaps the best college running back prospect I’ve seen when it comes to being a complete player at his position. He’s a physical freak at 5’10”, 235 pounds and he reminded me of Ricky Williams at his best. In fact, he looked quicker and faster than a runner Mike Ditka went all-in to acquire nearly a decade before. 2008 RSP Quote: Stewart is the most complete back in this draft. He has a good burst and enough speed to beat DBs down the sideline for long runs. Yet he also can run east-west, get hit in the backfield, and still shed tackles and hits with great balance. When he’s moving downhill, he will carry defenders for extra yardage but will also make a stutter move at full speed that can help him elude a defender with an angle. Stewart has the quickness to get to the corner of the defense and the patience to make cuts deep in the hole or cutbacks for extra yardage. He consistently carried the ball in the correct hand, caught the football with his hands as a receiver, and made the effort to block in the limited opportunities given to him in this game. Plus he had several gains over 10 yards, a 40-yard gain, and an 71-yard gain while playing with a turf toe injury that prevented him from praciticing consistently. He did this against a defense (South Florida) that only allowed Ray Rice to rush for 100 yards against them in nearly two seasons. Stewart reminds me a lot of Ricky Williams at his best. As an NFL fan I have to say that the most disappointing thing I’ve witnessed in the past five years is Stewart not getting feature back opportunities in the NFL. The talent of committee partner Deangelo Williams is certainly one of the contributing factors, but so is Stewart’s chronic Achilles issue that has held him out of practice and limited in ball games. But when Stewart gets starter carries he looks like the man among boys he was at Oregon. Although some of the best players are not that obvious, Peterson's talent was. Photo by Langzi. 1. 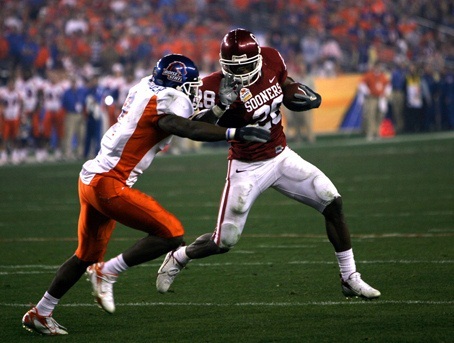 Adrian Peterson, Oklahoma: Who did you expect, Laurence Maroney? No disrespect to Maroney, he was an excellent college runner and barely missed the top-20. However, Peterson runs like he’s an elemental force of nature. While Marshawn Lynch might have had a tighter game from the standpoint of technique and Stewart was as freakish an athlete in terms of size-speed-strength-balance, there’s an added dimension to Peterson’s game that might just be intangible. Peterson runs like his life depends on the outcome of the play. He runs with a fierce spirit. Like a horse that refuses to be broken. Wild. Angry. Desperate. 2008 RSP Quote: [On] Raw talent alone, Peterson is one of the top two players in this entire draft. If he can be more disciplined as a runner—choices and ball protection—he has the type of rare power-speed-balance combos shared among the all-time great backs of the Brown-Dickerson-Campbell lineage. Although Peterson sometimes lacked the patience to press a hole and his ball security was a problem until 2010, his ability to set up defenders as he enters the second and third level of a defense is sometimes astoundingly great. The only back I’ve seen consistently do what Peterson does in the second level is Ryan Mathews and the former Fresno State bulldog lacks the same determination. It’s that will to win after contact that we saw from Walter Payton, Earl Campbell, and Jim Brown. I don’t think it was ever a question whether Peterson would become a Pro Bowl player, the only valid thought was whether he’d improve his ball security, pass protection, and patience to become a rare player, a great NFL player. Peterson was the best runner in the country as a true freshman. The things he does on the field only a few in the history of the game could do.